Forget What Did: From the people who brought you FLOORS. I laughed out loud, rather hard. Oh man. Also, thanks for your card. Made my day! Personally, I think this should be accompanied by a diet of some kind. This is brilliant! It really brightened up my day. 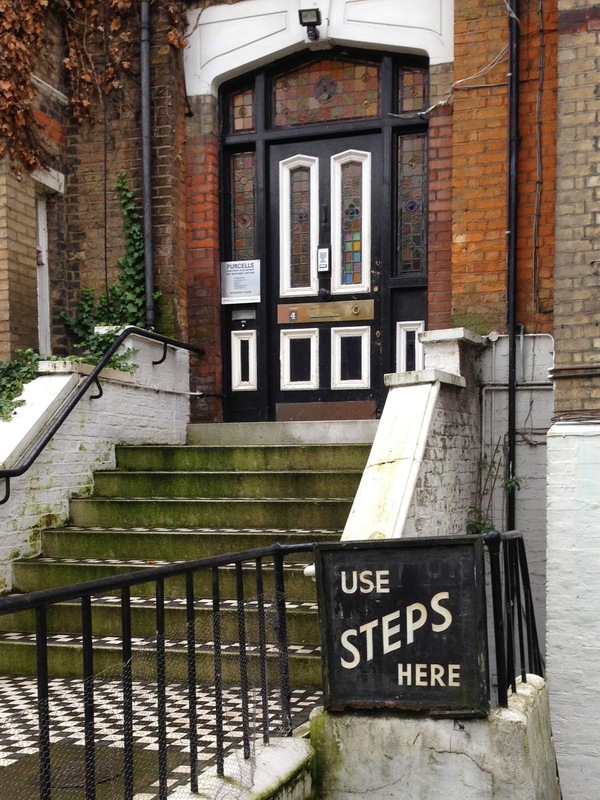 As titillating as those steps are (and you make them even more exuberant than that sign, really you do); I think I'd choose strongmen to lift me to the porch. I mean, if they are employed, they'd probably feel terrible if you chose the steps over them. I don't want to hurt a strongman's feelings, do you? Brightened my day no end! Awaiting Zurich-then how long after it airs until there's a contestant on "Mastermind" with CP as their chosen specialist subject? Enjoyed your "Private Passions" too. This comment will be utterly meaningless to non Radio 3 listeners but you know what I mean. Keep on making us laugh and hope there's a return appearance on ISIHAC in the pipeline-you're a natural at Mornington Crescent! It's just a note to the folks at the Beeb about which musical track to accompany this property on next week's Homes Under the Hammer. Oh that is so unfair - December! Having got our juices going by advertising that tickets were available (although we knew we wouldn't get any) and now, insult to injury, December and therefore no time for a re-broadcast before the year is out. I shall be writing to them upstairs or even Feedback in the highest of dudgeons and that's pretty high!! You are a marvel Mr. F, please don't stop doing what you do, you do it so very well. With this, I have now read the entirety of this blog. I am unsure if I should celebrate, or send for help. Steos were invented on Ascension Island in the last century. Regrettably, they did not invent descendible steps, and so on Ascension Island everyone lives at the top of a hill. It's like they've got FLOORS, and taken them up a level - amazing! What will they come up with next? Moving steps?? Oh what a world! (The Cabin Pressure stuff starts at 20'37'). I'm amused by the way Michael Berkeley pronounces 'downloading' in the introduction to that Private Passions podcast. It's as if he'd just discovered the word stuck to the sole of his shoe. (I'm going to go there to continue laughing my hyena howl now). I'd really like to get in touch but don't have any current contact details for you, hence this public plea... I don't want to post my email here, but if you fancied catching up you could drop me a line via my work email at the University of Southampton and I'll reply properly. I realise it's been a while!